Check Out This Amazing Flour! This sweet, rich flour is commonly found in Middle Eastern and Indian dishes like hummus and pakoras. Use it on its own, or blend equal parts garbanzo bean flour, quinoa flour, whole rice flour and cornstarch to create your own gluten-free flour mix. It’s official: Thrive Market is taking over your pantry in the best possible way. We now offer a variety of wholesome baking ingredients and nutritious grains. It’s the perfect collection for all dietary needs and healthy cravings. Make room in your cupboards and let’s get cooking! 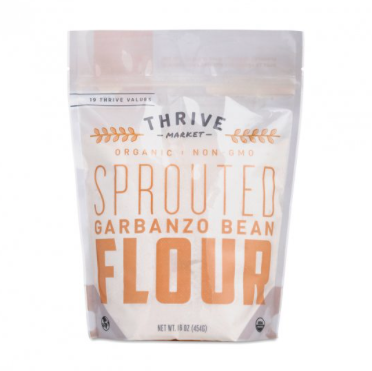 The new Thrive Market flours and grains are all organic, non-GMO, kosher, vegan, and contain no added sugars, sweeteners, dyes, or color additives. A regular grain is essentially a seed that you could put into the ground and it will become a plant. Sprouting allows these grain seeds to germinate, but then harvests them well before they bloom. In order for a shoot to grow, it digests starch from the seed, using it as energy to break through the outer shell. Therefore sprouted grains are lower in starch, and higher in nutrients like proteins, vitamins, and minerals. WHAT MAKES THRIVE MARKET PRODUCTS UNIQUE? The concept of sprouting is not a new one, but what is new is access and affordability. A lot of sprouted products are hard to find or too expensive to use regularly, until now. It’s the Thrive Market way: We offer high quality at a low, low price. This collection of baking essentials, sides, and snacks are incredibly versatile. Many of the flours are great for baking breads and sweets, coating fish and or poultry, or thickening soups and gravies. For example, garbanzo bean flour is a good base for savory items, like gluten-free pizza crust or pasta, spelt flour makes perfect pancakes or waffles. And of course, brown rice and quinoa are mealtime favorites— either as a side, or mixed with meat or veggies for the main. Read the back of each package to find new uses and recipes on how to make them. Meet the Thrive Market collection, a diverse group of high-quality pantry staples, wellness products, and home supplies at the best prices possible. Since our mission is to make healthy living easy and affordable, we created this line with our core values in mind—spanning from sustainability and social impact to nutrition and the environment—and designed each product to support your unique dietary needs and lifestyle. So get shopping, and stock your shelves with everything you need to thrive, like superfoods, oils, sprouted flours, nuts and seeds, spices, and more! California residents: Learn more on Prop 65 warning.Disclaimer: Information, statements, and reviews regarding products have not been evaluated by the Food and Drug Administration. Results vary person to person, and there is no guarantee of specific results. Thrive Market assumes no liability for inaccuracies or misstatements about products.